Chia pudding has been getting lots of attention lately. Both foodies and fitties alike have been obsessing over this healthy snack and breakfast treat, and if you have yet to hop on the bandwagon, you’ve been missing out. Unlike traditional puddings, chia pudding is not only beneficial to your health, but also quite filling due to the seeds’ very high fiber content. Once in contact with liquid, the seeds expand to 12x their original weight & size, and turn gelatinous. Think about the raw seeds entering your body, and then expanding as they work their way through your digestive track: The affect is similar to that of a snowball rolling down a snow covered hill, and as it gains momentum, it also starts to collect more snow around it. The seeds in your digestive tract move through your intestines, and do the same thing but pick up leftover bits of food. This can also help you lose weight! Chia seeds are a nutrition powerhouse, and easily fit into the superfood category. Per tablespoon, chia seeds offer more Omega 3 fatty acids than salmon. Omega 3’s are essential for brain development & mental health, heart health, & positive behavioral health in children to name just a few benefits. Surprisingly, many people are actually deficient in this essential fatty acid, mostly due to the 1990’s trend of trying to eliminate fat with “low fat” and “fat free” products dominating the grocery store shelves. The general public seemed to assume that fat in food = fat on your body, which isn’t true at all. Thankfully, people started to do their research and eventually came to realize that certain fats are healthy and in fact good for you! Calcium is a necessary vitamin in our diet, and chia seeds pack a punch — double that compared to a serving of almonds. As we all know, calcium is essential for building strong bones and to help your heart, muscles and nerves function. For those of you who are lactose-intolerant or vegan, you know how hard it can be to get enough calcium, so if you haven’t started sprinkling these beauties on everything yet, what’s stopping you? The Aztecs & Mayans considered these seeds a dietary staple, and knew how nutritious they were. The word chia coincidentally even translates to “strength” in Mayan, so it’s any wonder why these little black seeds are hailed as a superfood. Chia seeds are rich in antioxidants, which help to fight off free radicals which damage healthy cells in your body. Free radicals can contribute to not only aging but also diseases like cancer. 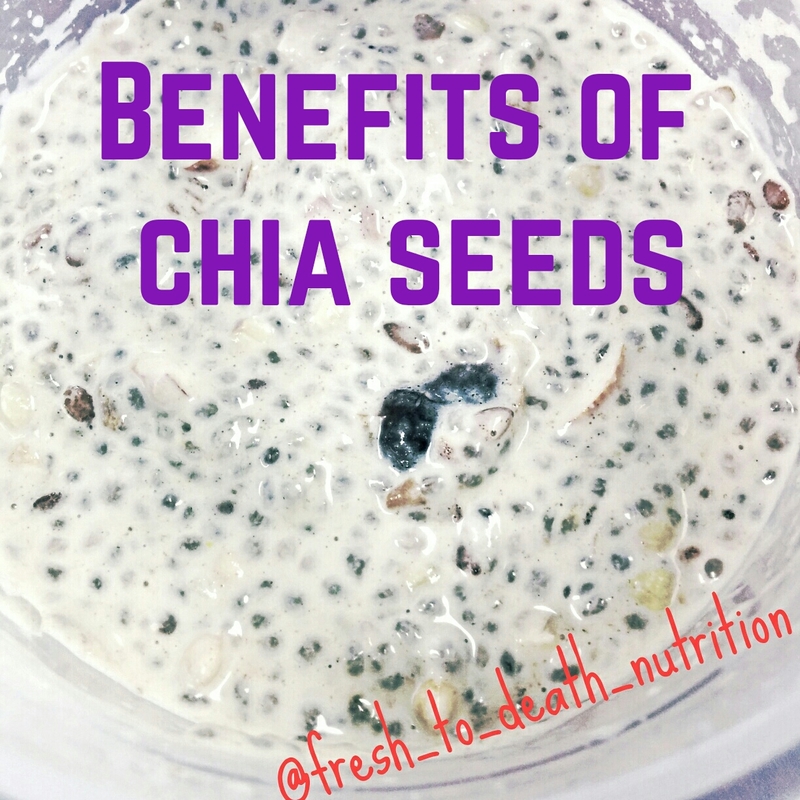 I like to add chia seeds to just about everything – just be sure not to add them to anything you’re not going to eat right away (meal prepping) as they will quickly “gel up” and have the potential to solidify a smoothie. I’ll sprinkle chia seeds on top of salads, mixed in with musli or granola, on top of parfaits, in oatmeal, but my favourite way to enjoy them is in a chia pudding. Combine all ingredients in a bowl with a lid. Place in fridge for 4 hours, stirring occasionally. It will be ready once it has “set” like traditional pudding. Experiment with different flavours by topping it with cinnamon, cacao, bee pollen, vanilla bean, or whatever tickles your fancy.